Most know the great Leslie Mac from her ferociously educational and takedown threads on Twitter. Or her groundbreaking work with the Safety Pin Box initiative and subscription service, in response to the uselessness and inaction of white allies who simply thought to slap on a safety pin to alert marginalized people that they are friendly. Or her Twitter thread of carefully assembled and pieced-together testaments from Black women about how “activists” can be virulently predatory toward Black women and queer people in modern liberation movements. But that’s the thing, though. 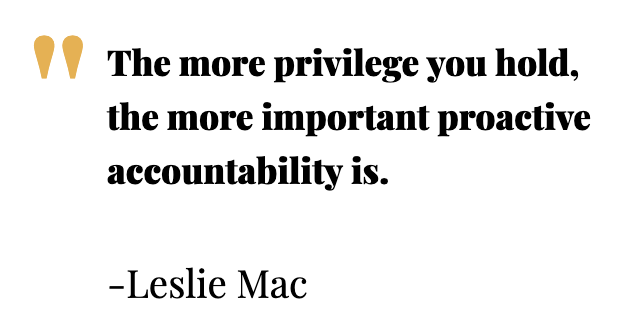 Many know Leslie Mac the activist or know her work. But never her, the person. She’s happy to set the record straight on that. Wear Your Voice - 10/26/18 - Leslie Mac and Talynn Are Bringing An Essential Discussion on Allyship to GeekGirlCon. This weekend, GeekGirlCon will convene in Seattle. Two days of women coming together to celebrate and revel in their geeky passions in STEM, gaming, comics, literature, film, arts, cosplay, and more. Many conventions like this exist, but this is one of the few that centers women. In spaces like these, racism can and often does rear its ugly head, making them into hostile spaces for people of color, especially Black participants. 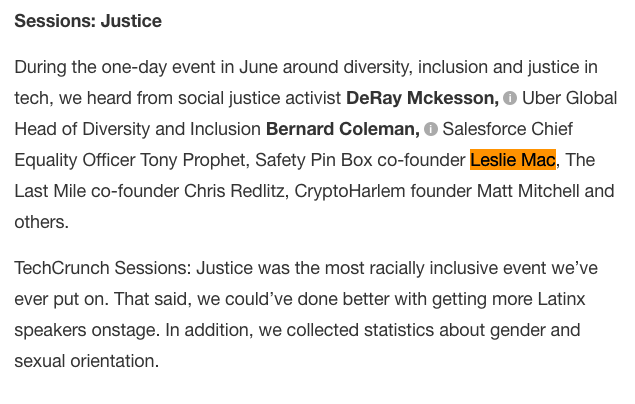 Leslie Mac, a self-described “activist, organizer, and dope Black woman,” and TaLynn Kel, a cosplayer of over thirteen years, plan to address this with their new workshop, “Allyship in Fandom”, calling for white people who consider themselves or aim to be “allies” to examine how they contribute to these harms, how to identify when they take place, and use their voice to stand up against them. I had the opportunity to have a conversation with these two talented women and get a sneak preview of what the workshop will entail and some insight on how it came to be. Brooklyn Reader - 10/12/18 - Has a Changing Flatbush Put Its Culture up for Sale? Activist and public speaker Leslie Mac talks about the impact of gentrification in the place she calls home. Upscale retail chains replace mom-and-pop shops, rents creep up, old timers move out — gentrification is striking to a Brooklyn transplant, but to Leslie Mac, a Flatbush-born-and-raised activist of Jamaican heritage, the pace of change is disorienting. A longtime activist who worked on issues like mass incarceration, bail reform, white supremacy and poverty, she founded the Ferguson Response Network in 2014. Mac also launched the subscription “Safety Pin Box” to help white people become better allies, and she is the lead organizer with Black Lives Matter of Unitarian Universalism. Mac, who lives in North Carolina but still considers Flatbush her home, shared her insights on the rapid gentrification of Flatbush, the commodification of culture and what responsible change looks like. Two women have created a subscription service aimed at channeling post-election white guilt into something constructive. Safety Pin Box, a new monthly subscription service, has a lofty goal - to help white people learn how to root out racism while simultaneously paying black activists for their time. The hashtag #WhereIsLavishReynolds appears to have been started by Leslie Mac, who describes herself as founder of the the Ferguson Response Network and who has a record of activism in the Black Lives Matter movement. The hashtag, which expresses the suspicion that Reynolds and her daughter would not be safe while in police custody, was rapidly taken up. Many used it not only to protest about the treatment of the mother and daughter but to also express outrage at Castile's shooting and other police killings. Black Lives of UU Report at UUA General Assembly - Columbus OH - 2016-06-23. The Black Lives of UU Organizing Collective hosts a TownHall Meeting focused on plans for #UUAGA2016 and plans for the coming months. Leslie Mac and Carlton Smith join The VUU to talk about their Movement for Black Lives Session at GA2016. How do we connect the desire to show up for racial justice with the reality of risk? Can we work together? Should we? How do we know when it's right and how do we make it work? Fast-moving and innovative social movements are rising around the world. Leslie Mac and Lena K. Gardner join the VUU to discuss callout culture, accountability, and compassion. In February 2015, Leslie Mac, founder of Ferguson Response Network and a member of the Organizing Collective of Black Lives UU, urged UU congregations to make our support visible by displaying Black Lives Matter Banners. This particular decision happened after many voices were raised opposing the book, led by Black Lives Matter activist Leslie Mac. Black Lives Matter activist Leslie Mac led the chorus of voices raised up against it. She talked about it on her podcast and began the Twitter hashtag #SlaveryWithASmile. Carlton Smith and Leslie Mac meet with the VUU regulars to talk about the Movement for Black Lives and UU. The backlash against the text was sparked by a critical review by Indiana librarian Edith Campbell that went viral on social media thanks to the efforts of Washington, D.C.–based nonprofit Teaching for Change. The organization shared the review on its Facebook page on Jan. 13. A subsequent protest petition on Change.org garnered 2,738 signatures, and Black Lives Matter activist Leslie Mac created the hashtag. The story went viral. Leslie Mac of the National #Ferguson Response Network created the hashtag #slaverywithasmile and within 24 hours articles appeared in the Atlanta Black Star, The Root, and Fusion. Leslie Mac, Lena Gardner, Carlton Elliott Smith, and Mykal Slack join The VUU panel. Carlton Smith and Leslie Mac join The VUU for a conversation about UUs and the Black Lives Matter movement. Standing On The Side of Love Campaign - 8/25/2015 - Ferguson is Everywhere. Panelists included Leslie Mac- Activist and Founder with the Ferguson Response Network, Rev. Elizabeth Nguyen- UUA Leadership Development Associate for Youth & Young Adults of Color, Rev. Leslie Mac, a UU activist who runs the Ferguson Response Network and the Black Lives Matter Visibility Campaign, believes articulating that “black lives matter” doesn’t contradict the faith’s principle of every person’s inherent worth and dignity, but in fact helps Unitarian Universalists live out that belief. “We are focused on humanizing black people and fighting issues that affect black life at disproportionate levels,” Mac said. Leslie Mac and David Carl Olson meet with The VUU team to discuss events in Ferguson, Baltimore, and beyond. Leslie Mac, a black UU from Cherry Hill, N.J., and one of the leading organizers of the Ferguson National Response Network, led the effort, which provided 2,100 lunches or snacks from three sites in the city. The VUU - 1/29/2015 - Special guests Kenny Wiley, Leslie Mac, and CLF's own Lena K. Gardner join regular hosts Meg Riley, Joanna Crawford, Patrice Curtis, Tom Schade, and Hank Pierce to discuss #BlackLivesMatter. Some of the leaders who helped lead Monday's "MLK DARE" march include , Rev. Greg Holston, POWER; Paul Winston Cange, PURP; Raphael Curtis, Fight for 15 (min.wage); Leslie Mac, Ferguson Response Network; Diane Isser, 15 Now; Tamara Anderson, Caucus for Working Educators; Bishop Dwayne Royster, POWER; and Rev. Mark Tyler, POWER. All of these leaders are featured on the podcast. The Ferguson National Response Network, which has organized a number of protests since African American teenager Michael Brown was killed in August, posted over a dozen protest locations around the country, including Orlando, Pittsburgh, Reno, Buffalo, St. Louis, Los Angeles, Dallas, Atlanta and more. The Network was created by Philadelphia resident Leslie Mac, it works with the Ferguson Action group. The Ferguson National Response Network, an organization that has galvanized demonstrators in the aftermath of the August shooting of 18-year-old Michael Brown, organized a student walkout today at 12:01 p.m. CST (the approximate time of Brown’s death on August 9 in Ferguson, Missouri). The organization was started by Philadelphia resident Leslie Mac, together with the Ferguson Action group, and has organized dozens of protests across the country following the grand jury decision not to indict Ferguson police officer Darren Wilson. More than 100 U.S. cities have staged Ferguson-related protests since the grand jury said it would not indict Wilson for shooting Brown, who was unarmed. Each day, protest activity in various cities is listed on a website created by Leslie Mac, 38, an activist from Philadelphia. Mac said she started the Ferguson National Response Network after participating in a conference call St. Louis pastors earlier this month. The local clergy didn’t have a strategy for coordinating protest activity on a national scale, she said. The site has become a hub for people outside of Missouri who want to participate in Ferguson-related protests. Groups have shut down mass transit in California, blocked highways in Washington and shut down shopping malls in greater St. Louis. Protesters in more than 40 cities plan to walk out of schools and businesses today, according the website. Leslie Mac, who runs a website that aggregates Ferguson-related protests nationwide, told Bloomberg more are planned in shopping locations in more than 40 cities. Leslie Mac, a Philadelphia activist who founded the Ferguson National Response Network website, said activists across the country are linking Brown’s death and the killings of other unarmed black males. She highlighted deaths including those of Rice and Eric Garner, an unarmed black man killed by New York police officers in July during an arrest on Staten Island. Cherry Hill resident Leslie Mac, an account executive at a Philadelphia-area IT training company, is responsible for organizing Philly’s branch of the nationwide vigil, which is scheduled to take place at LOVE Park at 16th Street and JFK Boulevard on the designated date and time, Aug. 14 at 7 p.m. (EST). At 7:20 p.m., each vigil is expected to have a unified moment of silence. MacFadyen is a founding member of the Unitarian Universal Legislative Ministry of New Jersey’s “Ending the New Jim Crow Task Force,” aimed at ending mass incarceration with state legislation. She learned of the hashtag and ensuing vigils from Jones’ Twitter account.